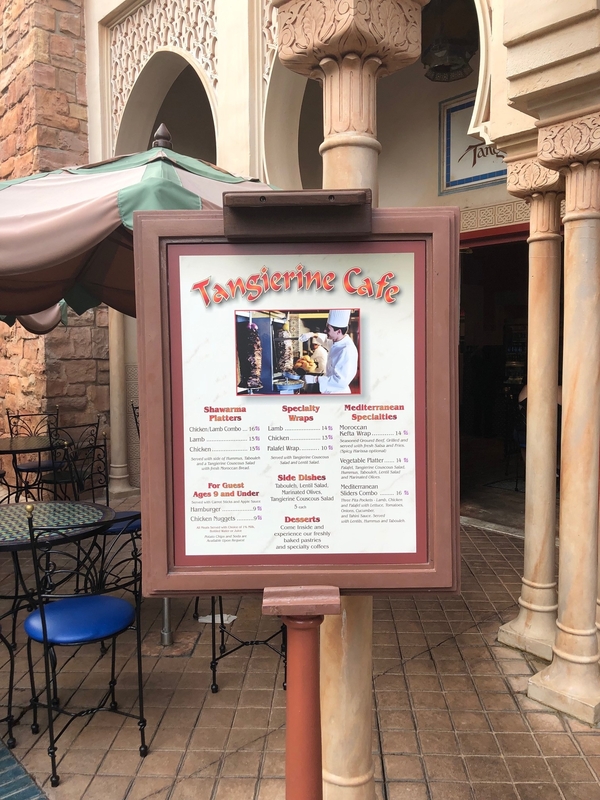 There’s one restaurant at Epcot that we’ve been returning to over and over for more than a decade: Tangierine Café in the Morocco pavilion. This counter service venue is small and has a limited menu, but it packs in wonderful flavors and is a great value whether you’re on the dining plan or not. The restaurant is tucked into one of the buildings in the pavilion. 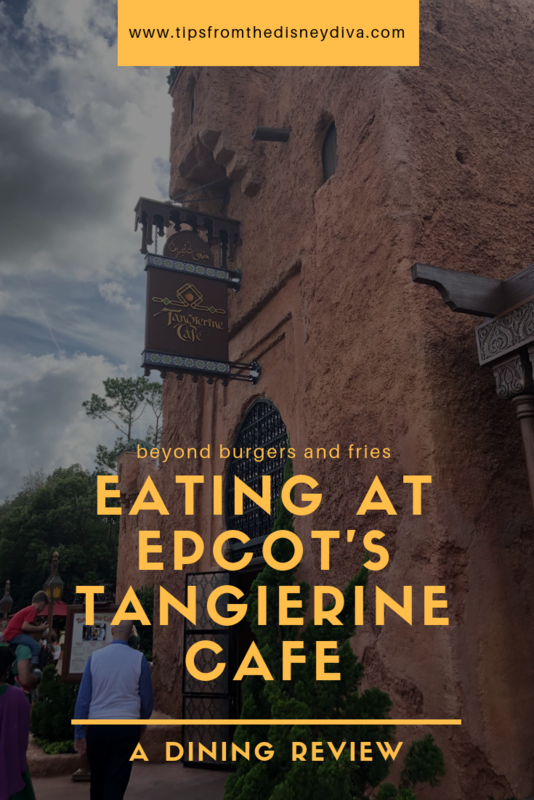 While there’s a few tables inside, we usually choose to bring our food outside to the lovely, shaded courtyard next to the fountain. The complete menu is not listed on the website, but you can see it here. For the meat lover, you can choose between a Lamb or Chicken Shawarma Platter ($15), or a combination of both ($16). My husband usually gets the lamb platter because the meat is so tender, but he’s ordered the combo as well, and always been happy with it. The platters come with three sides and a piece of bread (sometimes it’s pita, other times it’s been a puffier piece of Moroccan bread). The Vegetable Platter ($14) is, I am told, vegan as is, but it’s always worth asking about ingredients in case they’ve changed something. The platter comes with falafel on a bed of lettuce, three sides, marinated olives, and a piece of bread/pita. 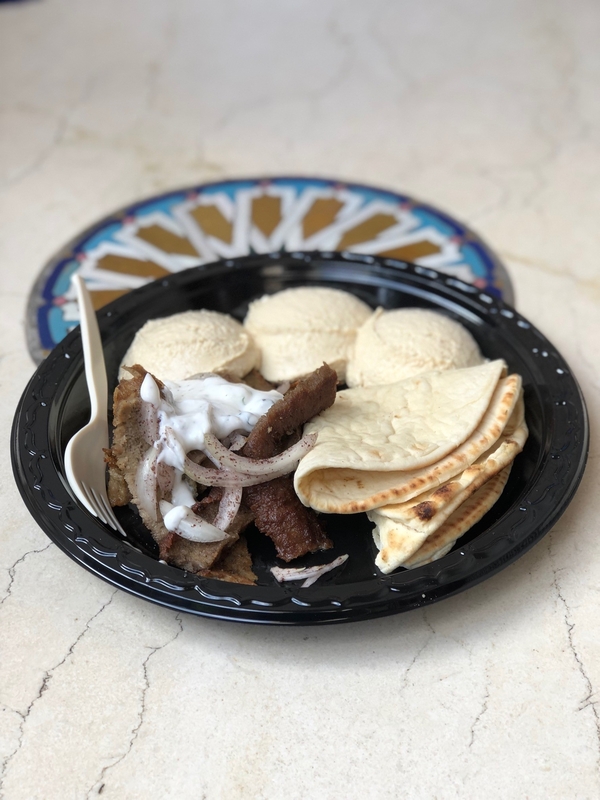 The Lamb Shawarma platter with hummus substituted for all three sides. The Vegetable Platter is both vegan and vegetarian. Tip: If you are on the Disney Dining Plan, the platters are going to be the best bang for your buck since they are much larger and include more sides. The side dishes are tabbouleh, lentil salad, hummus, Tangierine couscous salad, French fries, and marinated olives. 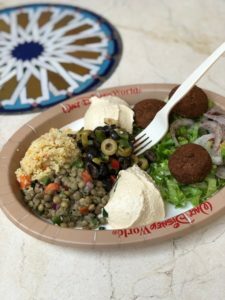 The platters will typically come with hummus, couscous, and tabbouleh as the three sides, but you can definitely tell the cast member that you want to substitute sides. My husband isn’t much of a salad guy, and on our most recent trip he asked to substitute hummus for *all* of the sides. 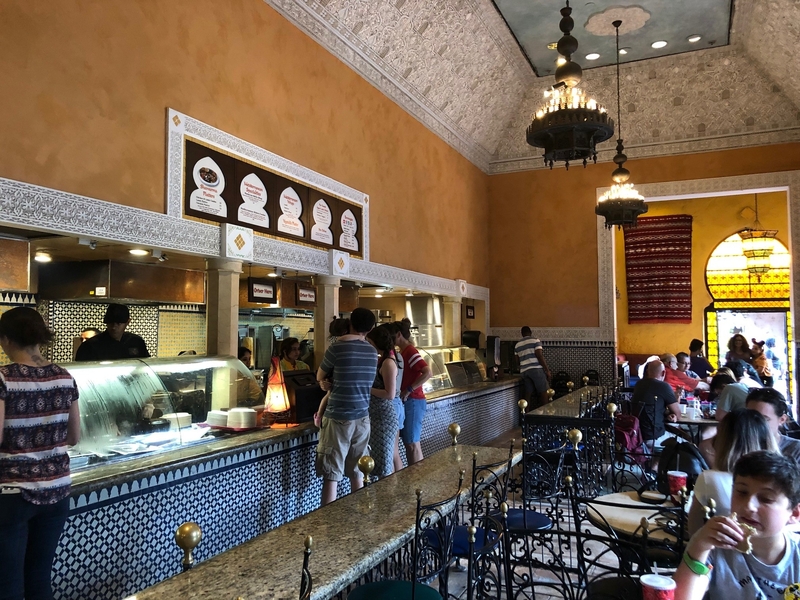 The cafe’s interior has lovely Moroccan decor. I, on the other hand, am a huge fan of the couscous salad, the lentils, and the olives, but don’t care for the tabbouleh salad – it’s a little too tart for me, and I’m not that fond of parsley. So, I asked for a double portion of hummus instead of tabbouleh on my most recent Vegetable Platter. 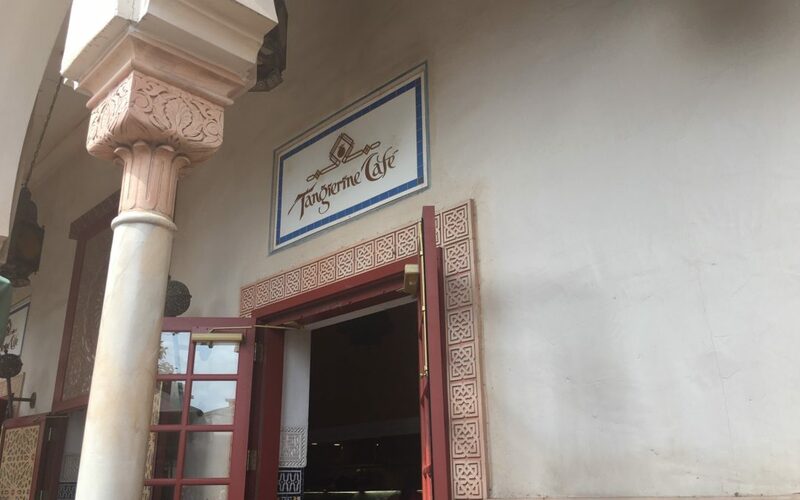 The Cafe also features a Coffee Bar with Moroccan coffee, alcoholic drinks, and pastries. Tip: If you want to save money, split an entrée and order water as a beverage. Water cups are always free at Disney dining locations. The platters are huge, and easily shared. I often split the Vegetable platter with my younger daughter. 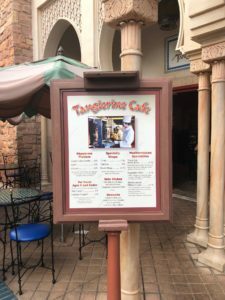 For less adventurous eaters, the kid’s menu also offers theme park standards like chicken nuggets, hamburgers, and fries. For even pickier eaters, like my older daughter, we have just ordered food from other pavilions and brought the trays over so she can sit at the café with us. 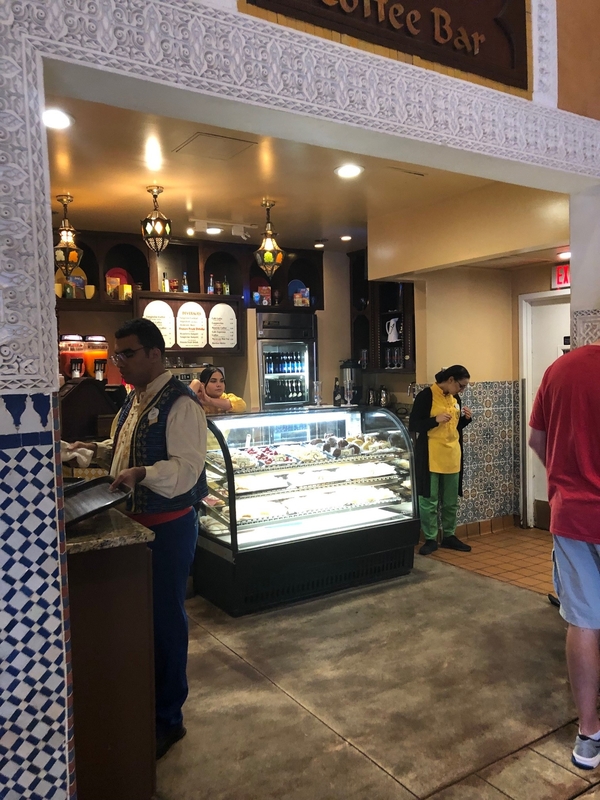 Just to the side of the food pick up area is a small Coffee Bar with various Moroccan pastries, coffees, and alcoholic beverages. I’m always too full, however, to partake of baklava or any of the other sweets. This restaurant is proof that you don’t have to stick with hamburgers and hotdogs when you go to an amusement park. 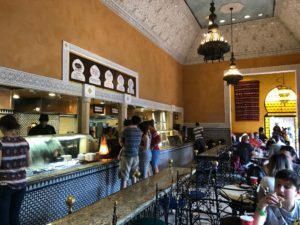 We love the authentic flavors of this place, and also the fact that there’s rarely a crowd here. I love the theming of this pavilion, and like to wander around after our meal. 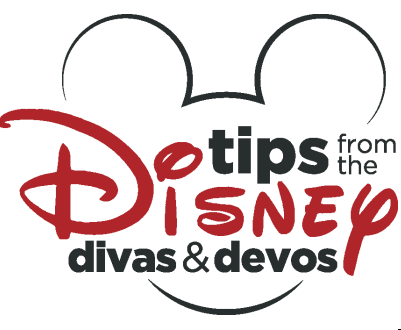 Thinking about a trip to Walt Disney World? Contact Patricia at All For Dreams travel for a FREE quote and lots of great planning advice! If you’re eating Burger & Fries you’re doing it Wrong! !